that God should raise the dead? Notice... the grand fact of the resurrection of the Lord Jesus Christ. On this the whole verity of the Christian faith may be said to be suspended. If Jesus did not rise from the dead, He was not what He declared he was, "the Son of the living God." 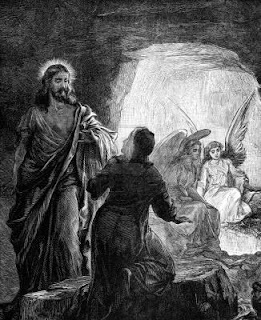 But if He rose from the dead, it was God’s own attestation that He was his only begotten Son, for all will admit that nothing short of the power of God can raise the dead. For this reason we find in the Acts of the Apostles the resurrection of the Lord Jesus made a leading feature in every sermon and every address. Look for a few moments at this remarkable circumstance, that these blessed men of God made the resurrection of Jesus, as it were, the very foundation of all their sermons and addresses; for we may be sure that the Holy Ghost inspired the apostles thus to preach. And see the reason why they bore this firm testimony in the very forefront of the battle which they waged in the name of God against the kingdom of darkness and death. The Lord of life and glory had been condemned to death by the Jewish council on a charge of blasphemy, first, because He had said that "He would destroy the temple made with hands, and within three days build another made without hands" (Mr 14:58); and, secondly, that He had declared, in the very presence of the council, that He was the Christ, the Son of God (Mr 14:61-64). He therefore died under the charge of blasphemy, in pain and ignominy, crucified openly for that alleged crime in the face of the assembled thousands who had come from all parts to Jerusalem to celebrate the Passover. Now, had Jesus not risen from the dead that charge would have been substantiated, and He would have been justly convicted by the voices of many thousands as having been put righteously to death. It was necessary, then, not only for the whole economy of redemption, but for the very veracity of Jesus Himself, and for the whole truth of the Gospel, that He should be raised from the dead by the power of God as the seal of His mission, as the standing, undeniable, irrefragable [not to be contested, ed.] truth that He was the Messiah, the Son of God, as He claimed to be. But because, after the resurrection, the Lord came miraculously into the place where the disciples were assembled, the doors being shut, and vanished out of the sight of the disciples at Emmaus, and because they cannot conceive how He can wear a human body in heaven, such as He had upon earth, men who would be wise above what is written have assumed that a change took place in that body, and that it no longer consisted of flesh, and bones, and blood, as before, but was, as it were, transmuted into some aerial, celestial substance, they know not what, but such as they imagine would be more fitting to inhabit the courts of heaven. Now, nothing can be more plain, if we are willing to follow the footsteps of the Holy Ghost, than that it was the same identical body which hung on the cross that rose from the dead. It would seem, as if to stop all cavil, and crush in the very bud all such erroneous speculations as we have alluded to, the Lord Himself gave again and again the most incontrovertible proofs after His resurrection that He was the same Jesus as before, and not another, and that He wore the same body in all respects without change or alteration. He did not appear for a few moments only, as if "showing himself through the lattice," and then hastily withdrawing, but conversed with them most familiarly, and ate with His disciples after the resurrection (Lu 24:42,43 Ac 10:41); and for this very purpose, that they might be standing and undeniable eye and ear witnesses that it was indeed the very same Jesus with whom they had consorted before His crucifixion. Now we all know what a marked change a little alteration makes in a person’s form and features, so that a severe illness, or the lapse of a few years, makes him scarcely recognizable as the same person by even his most intimate friends. If, then, any visible change had taken place in the body of the Lord Jesus, it would not only have destroyed its identity but its identification. The whole chain of evidence that it was indeed the same Jesus Who had been crucified that was risen from the dead would have been broken to pieces unless it was clearly and undeniably the same form, the same features, the same feet and hands, the same voice - in a word, the very same Jesus whom they knew so well and loved so dearly. Did not Mary Magdalene know His form and features well? Could she have been deceived? Was not John, who leaned on His breast at the last supper, well acquainted with His voice, gestures, and countenance? Could he have been deceived? So with Peter and James, not to name the other disciples who had attended Him daily from the baptism of John (Ac 1:22). One witness might be deceived, but not so many. But besides this, there were several special seasons on which the Lord did not only appear for a short time to His disciples, but was with them some space. Look at the instance of Thomas. What can exceed the clearness of the testimony mercifully produced by his very unbelief? So firmly fixed was he in his disbelief of the resurrection that he would not believe that the disciples had seen the Lord as risen from the dead; and declared that except he should see in His hands the print of the nails; and, lest his eyes should deceive him, unless he put his fingers into the print of the nails; and even lest he should be deceived then, except he should thrust his hand into the very side which had been pierced by the Roman spear, he would not believe. But how condescendingly to him, and how graciously for the saints in all ages, did the blessed Lord, eight days after this unbelieving declaration, appear again gently to reprove him for his unbelief, but at the same time to afford to the church through him the memorable testimony that He wore still the same body; that the hands were the very same hands, still bearing the print of the nails which had fastened them to the cross, and that it was the very same side which still wore the thrust-mark of the Roman spear. If this were not a proof of actual identity where shall we find one? If this evidence be rejected, what remains but to reject the whole mystery of the resurrection as an idle tale? Learned men have, by comparing Scripture with Scripture, ascertained that the blessed Lord appeared ten times to eye-witnesses after his resurrection and that at some of these appearances, as that memorable one recorded [in] John 21, He conversed with His disciples as closely and as intimately as before His resurrection. And that His human body in which He ate and talked with them was not a shadowy appearance, which had neither flesh nor bones, He spake to them those ever-memorable words, "Behold My hands and My feet, that it is I Myself; handle Me, and see; for a spirit hath not flesh and bones, as ye see Me have." (Lu 24:39). "Behold," said He, "my hands and my feet" - they are real hands, they are real feet; "that it is I Myself," the same, the very same Jesus, having the same body which you saw Him wear before; "handle Me, and see," feel, if you will, whether it be real flesh or an aerial body, "for a spirit," such as you take Me to be, a disembodied soul, or an airy, unreal phantasm, "hath not flesh and bones, as ye see Me have." His tenth and last to all the apostles assembled at Jerusalem just before His ascension - (Lu 24:44-49 Ac 1:4-8 1Co 15:7). These are the "many infallible proofs" of which the Holy Ghost speaks (Ac 1:3) that He was really and truly risen from the dead. Pope Francis: History’s Final Pope? On March 13, Cardinal Jorge Mario Bergoglio Of Buenos Aires was elected as the newest pope of the Roman Catholic Church in the wake of the resignation of Pope Benedict XVI on February 23. Jorge Bergoglio is the first Latin American pope, the first Jesuit pope, and the first pope to take the name “Francis.” However, will Pope Francis be history’s last pope? That this pope likely will be the last one is the message of Petrus Romanus: The Final Pope Is Here, a 2012 book by Thomas Horn and Cris Putnam. Because Petrus Romanus suggests that the pope after Benedict XVI will be history’s final pope, the book has received a lot of attention over the past year, and especially since Pope Benedict XVI’s resignation. Now the book has received yet another significant boost with the selection of Cardinal Bergoglio. St. Malachy was an Irish bishop who lived in the 12th century. By far the more famous of his prophecies concerns the sequence of popes. The prophecy consist [sic] of 112 short Latin descriptions of future popes; the prophecies were discovered in 1590 and attributed to Malachy. Each description indicates one identifying trait for each future pope, beginning with Celestine II, who was elected in 1130. In some instances, the descriptions hit home in an uncanny way; they have led to centuries of speculation that the prophecy might be a real one. In persecutione extrema S. R. E. sedebit Petrus Romanus, qui pascet oves in multis tribulationibus: quibus transactis civitas septicollis deruetur et judex tremendus judicabit populum. Finis. Although a Roman Catholic pope had not stepped down in nearly 600 years, the startling resignation of Pope Benedict XVI was predicted by the co-authors of a book published last spring about a medieval prophecy that the next pontiff will be the last. In “Petrus Romanus: The Final Pope is Here,” co-authors Tom Horn and Cris Putnam examine St. Malachy’s “Prophecy of the Popes,” said to be based on his prophetic vision of the next 112 popes, beginning with Pope Celestine II, who died in 1144. Malachy presented a description of each pope, culminating with the “final pope,” “Peter the Roman,” whose reign would end with the destruction of Rome and judgment. All of this is so problematic on so many levels, it would take several articles to deal with it adequately, so for the sake of relative brevity I’ll just discuss a few of the major issues. It is difficult to imagine why Horn and Putnam, who are considered evangelicals, would lend so much credibility to Malachy’s prophecy. Their work does not simply explore the question of whether Malachy may have accurately predicted all future popes. Rather the point of Petrus Romanus is to demonstrate that his prophecy is accurate, meaning they obviously think it is a genuine prophecy to be accepted as true. So, then the question is, Was Malachy actually a prophet of God—or was he at least inspired by God to give this list of popes to the world? 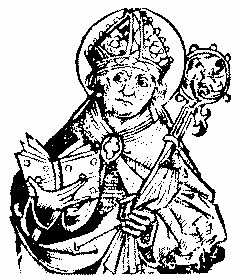 St. Malachy, whose family name was O’Morgair, was born in Armagh in 1094. St. Bernard describes him as of noble birth. He was baptized Maelmhaedhoc (a name which has been Latinized as Malachy) and was trained under Imhar O’Hagan, subsequently Abbot of Armagh. After a long course of studies he was ordained priest by St. Cellach (Celsus) in 1119. . . He was then chosen Abbot of Bangor, in 1123. A year later, he was consecrated Bishop of Connor, and, in 1132, he was promoted to the primacy of Armagh. In 1127 he paid a second visit to Lismore and acted for a time as confessor to Cormac MacCarthy, Prince of Desmond. . . . On the death of St. Celsus (who was buried at Lismore in 1129), St. Malachy was appointed Archbishop of Armagh, 1132, which dignity he accepted with great reluctance. During three years at Armagh, as St. Bernard writes, St. Malachy restored the discipline of the Church, grown lax during the intruded rule of a series of lay-abbots, and had the Roman Liturgy adopted. Early in 1139 he journeyed to Rome, via Scotland, England, and France, visiting St. Bernard at Clairvaux. He petitioned Pope Innocent for palliums for the Sees of Armagh and Cashel, and was appointed legate for Ireland. On his return visit to Clairvaux he obtained five monks for a foundation in Ireland, under Christian, an Irishman, as superior: thus arose the great Abbey of Mellifont in 1142. St. Malachy set out on a second journey to Rome in 1148, but on arriving at Clairvaux he fell sick, and died in the arms of St. Bernard, on 2 November. The point of including all of this rather detailed biographical information is to show that Malachy was a thoroughly Roman Catholic bishop of the medieval period. This means that the heretical theology and pagan practices that shaped the Church of Rome in the centuries leading up to and actually precipitated the Reformation were undoubtedly an integral part of Malachy’s life. That being the case, should Malachy really be regarded as a prophet of God by evangelicals (when this is even questioned by some Catholic theologians)? Furthermore, if he was not a prophet of God yet had mystical experiences and claimed to have visions of the future, does that not rather make him a false prophet by definition? Again, how can two evangelical authors appeal to such a person for support—and why would evangelicals among their readership be willing to accept their conclusions concerning Malachy? Such acceptance of notoriously inaccurate and problematic medieval accounts of Roman Catholic miracle workers, mystics and prophets only serves to underscore concerns that biblical discernment is fast disappearing even among some more theologically conservative Christians. “Two things like little pigs came out?” Is it reasonable to believe that these bishops of the medieval Roman Catholic Church (who held to such unbiblical doctrines and practices as they did) were genuinely serving the God of the Bible and being used by Him in this way? And is it reasonable to believe that the Lord would have been involved with these things when they would have only served to validate the heresies these men believed, practiced and taught? Furthermore, the authors don’t even acknowledge the possibility that these may be entirely false reports—or worse. If these reports are actually true, it must also be considered that there may have been supernatural forces at work that were not of God. Undoubtedly many false prophets are simply deceivers. However, others may be acting under the demonic influence of those beings who have the desire and ability to influence the outcome of events such that these prophets are able to accurately “predict” the future. Of course, because only God in His omniscience can know and reveal the future, false prophets (even those under demonic influence) are very susceptible to errors in their predictions—which is obviously one reason they can actually be caught and identified as false prophets. Unfortunately, Horn’s and Putnam’s failure to at least consider the possibility of them being false prophets highlights a very real problem that plagues an increasingly large segment of Christianity. It seems to be broadly assumed and often taken for granted that if something inexplicable and apparently supernatural takes place in almost any sort of Christian religious setting, then it must be from God. In light of these warnings, to rely on Malachy as a legitimate source of prophecy requires so many questionable and misguided presuppositions that any conclusions that they are from God can never be more than outright speculation. Yet, there is no doubt, and it requires no speculation to recognize that Malachy was most certainly a false prophet during a time when false prophets flourished within Christendom. Unfortunately, the situation today is no better—and arguably it has become worse. Another significant problem with Malachy’s prophecies is that there are serious doubts about the authenticity of the documents in which they appear. There is important and compelling evidence (which is widely accepted) that strongly points to the fact that these documents were actually forgeries created in the 16th century. There have been many more misses, though. Describing the popes to follow John XXIII are the phrases “flower of flowers” (Paul VI), “from a half-moon” (John Paul I), and “from the toil of the sun” (John Paul II), none of which is an obvious connection. After our current pope there are only two left in Malachy’s prophecy, “the glory of the olive” and “Peter the Roman.” The latter will supposedly lead the Church through many tribulations, concluding with the last judgment. Even so, it very well could be the work of Saint Malachy coarsely corrupted by a forger. Of course, this would fall neatly in line with the Roman Catholic practice demonstrated by the Donation of Constantine and Pseudo–Isidorian Decretals. Alternatively, some have suggested it was partially the work of Nostradamus cleverly disguised to protect his identity. While the identity of the actual prophet remains unclear, the author was a prophet whether he knew or not. How is this “exciting news,” and how is it “still a genuine prophecy?” If there really are so many “sometimes jaw-dropping” fulfillments, why would there be so much skepticism among scholars, even within the Roman Catholic Church (given that the Church has historically accepted such dreams, visions and prophecies)? So, although the authors rely on Hogue for support, he is, by their own admission, a false prophet who is highly regarded as an “expert” on another false prophet, Nostradamus. (And the fact that Hogue is a regular guest on Coast to Coast is not exactly a positive since that radio program showcases some of the most outlandish personalities and topics of any program in the nation.) Furthermore, the “Nostradamus” section of Hogue’s website makes it clear that he, too, fully believes the prophecies of Nostradamus are genuine, just as much as Malachy’s are. It would seem that Horn and Putnam could hardly have found a more unreliable and biased source of information pertaining to this particular issue. However, it appears that the authors view prophets and prophecy the same way Hogue does, namely that genuine prophets aren’t necessarily 100% accurate. The biblical view would not be that the prophecies’ author was one of the most astounding prophets in history, but rather that he was a false prophet with an astounding accuracy rate. This is consistent with the prevailing view in the Charismatic movement that prophets of the present age do not need to be 100% accurate to be genuine prophets of God. There are two significant problems with this view because it contradicts both the Old Testament and New Testament standards for prophecies and prophets. The first problem is that the OT standard is 100% accuracy and failure to be completely accurate is an identifying characteristic of a false prophet. The second problem is that it essentially eliminates “false prophet” as an objective category since someone could have multiple false prophecies and still be considered a genuine prophet of God. Yet, Peter makes it clear that false prophets will be a problem faced by the church in this age, which means they must be identified—but how? Therefore, even though the first half of the list has been altered, the entire original document, if written by the same person, may have also been a record of genuine prophecies because of what they maintain are fulfillments of the prophecies in the second half. The statement about Thibaut being a mystic is also troubling. Horn and Putnam apparently view this favorably and see it as a helpful factor in his arriving at correct conclusions. At points it becomes rather difficult to take the authors seriously as they appear to be willing to grasp at virtually anything for support no matter how far-fetched it seems. In this case, they rely on Thibeau’s cryptographic analysis of the supposed prophetic text. Much could be said about just this issue when discussing just the matter of an encryption key alone. The Mayan calendar ends in 2012 with the return of their flying dragon god Kulkulkan. The Aztec calendar ends in 2012 and their flying dragon god Quetzalcoatl returns. According to ancient Mayan inscriptions, in 2012, the Mayan underworld god Bolon Yokte Ku also returns. The obvious question this raises is, How is this minister’s prophecy any different from the utterly failed prophecies of Harold Camping concerning the Rapture taking place in 2012? Or how does it differ from Edward Whisnant’s predictions, which are set forth in his book 88 Reasons Why the Rapture Will Be in 1988? In addition to interpreting Scripture, the “Vaera” section (volume 3, section 34) includes “The signs heralding Mashiach,” or “The coming of the Messiah.” The fascinating date for “his” appearance is set in the Zohar in late 2012! Given the rejection of Jesus by orthodox Jews as Messiah, Christians understand this “coming” would herald the unveiling of Antichrist in 2012. Even though angelic beings (elect or evil) might be able to make good guesses about the future, they are not omniscient and therefore cannot see or otherwise know the future with certainty. Another possibility is that demons manipulate events so as to give the impression of fulfilled prophecy. (Horn and Putnam acknowledge both of these near the beginning of chapter 2.) Therefore, prophecies cannot be considered reliable unless it is presumed that God is involved in some way—that somehow “God just got in there” and in some way inspired all those pagans to accurately prophesy. If this were not true they would be relying on false prophets, who are either making predictions on their own or are being influenced by demonic forces.The problem is that they have no objective way to determine which of the various possibilities is actually occurring, yet in the final analysis they choose in favor of God’s inspiration and genuine prophecies through multiple pagans and false prophets. Did God “just get in there,” too? 19. Beyond the absurdity of appealing to a computer program because of its supposed accurate “prophetic” abilities, Horn and Putnam seem to miss the obvious explanation for the program’s prediction of apocalyptic events in December 2012. The results provided by the Web Bot Project depend entirely upon tracking references on the internet to the end of the world. The end of the Mayan calender cycle on December 21, 2012, which was interpreted by many as marking doomsday, was discussed by countless writers on countless websites and media outlets around the world. How can it be actually suggested that this is a prediction by a computer program that was “taking on a mind of its own?” Any search engine would have produced the same results, as it was only monitoring things that had already happened. The fact that the Web Bot Project even needs to be discussed at all is probably sufficient commentary on the whole issue by itself. The authors also spend a lot of time discussing the historicist view of the book Revelation, which holds that the last book of the Bible portrays how history will play out. This is in contrast to the futurist view which sees the entire fulfillment of Revelation in the future, after the rapture of the church. Although they argue for a “hybrid view” with elements of both the historicist and futurist views, they lend a lot of weight to the work of historicists, particularly a number of date calculations that point to 2012 as the endpoint and year of the culmination of these events. While not drawing firm conclusions based solely on these, they do believe all of these things seem to provide significant support for their overall thesis. The fulfillment of the “prophecy”? Although Horn now believes that Cardinal Bergoglio likely became the fulfillment of Malachy’s prophecy on March 14, when Petrus Romanus was released almost a year ago, he and his co-author spent a great deal of time trying to show how several other cardinals could fulfill the prophecy and become Peter the Roman. In fact, they provide a list of their top ten candidates based on their extensive research. However, this is not the only problem in Horn’s argument concerning prophetic fulfillment and the name Benedict XVI’s successor would take for himself. One person with great influence on the author’s theories is Ronald Conte, Jr., who believed that Francis Arinze would be the next pope (and who also happened to be black). Conte is a Roman Catholic layman who identifies himself as a theologian and to whom Horn and Putnam refer as a mystic in Petrus Romanus. There is war, insurrection, and coups among the Arab/Muslim nations of the Middle East and northern Africa. Extremist leaders fight against more moderate leaders, and the extremists win. If they cannot win by coups and insurrections, then one Arab nation attacks another in outright war. The war and the insurrections and coups end within the same year that they began. Then the leader of Iran and the leader of Iraq will have much power and influence over the other Arab/Muslim nations, all of which will be led by extremists. The holy Pope Benedict XVI dies. The holy Pope called ‘Peter the Roman’ by St. Malachy is elected. I think that he will be Cardinal Arinze and that he will take the name Pope Pius XIII. New York City will be struck by a nuclear bomb (not a missile; not a dirty bomb) in 2011 (sometime after the Miracle, in the same calendar year). You will make them like an oven of fire, in the time of your presence. The Lord will stir them up with his wrath, and fire will devour them. World War 3 begins as a result of the nuclear attack on New York City. World War 3 is the first horseman of the apocalypse and the first of the Seven Seals. World War 3 is a war in which the Arab/Muslim nations of the Middle East and northern Africa invade and conquer all of Europe, parts of Eastern Europe, parts of Scandinavia, and the northern part of Africa above the equator. During the Reign of Pope Pius XIII (2011 to 2013) he will emphasize the authority of the Roman Pontiff. In the year 2012, during World War 3, he will flee the Vatican at night, he will flee to a location to hide, but then he will be captured by the Arab forces, he will be taken to Syria, he will put on trial and be given an unjust verdict and sentence, he will watch as they kill members of the clergy in front of him. Then they will blind him by putting out his eyes. They will bind him and send him to prison in Iraq. Soon he will die in that prison in Iraq; no one will be able to rescue him. For a time, the Popes after him will not reign from Rome, until the year 2040, when the papacy returns to Rome. He is NOT the last Pope ever; there will be many more Popes and many centuries before Christ Returns. It is difficult to fathom the sort of ethic and methodology that would allow Horn and Putnam to use part of Conte’s work as support for their theories while remaining completely silent about the vast majority of his predictions, which have turned out to be patently false and / or completely contradicted other portions of their theories. So, rather than even considering that “black” might refer to a Jesuit, they were focused on two Cardinals who are racially black. Then the authors demonstrate that they are willing to grasp at anything to prove their points as they go on to suggest that Barack Obama’s election as the first black American president could actually pave the way for a black pope. Is it even remotely possible that the College of Cardinals (which is an international group of men who answer to no one except the pope) would be influenced in the least by the race of the President of the United States? It is just this sort of tortured logic that is actually the glue that holds everything in Petrus Romanus together and that even now continues to allow Horn to see fulfillment of the prophecies of Malachy and Nostradamus in the newly elected pope. And finally, although Horn and Putnam do state that they are not setting dates and argue that they are merely reporting what others have written concerning 2012, in Petrus Romanus they are very focused on 2012 as the likely year of fulfillment of Malachy’s prophecy. This can be seen in the pagan prophecies they cite, all of which point to 2012. They also see significance in the fact that 2012 was predicted by Thibaut, as well. Once again, it seems that no matter what actually happens, virtually everything is interpreted as being a confirmation of their conclusions. However, Horn and Putnam are still faced with the fact that essentially none of the supporting / corroborating pagan prophecies were actually fulfilled in 2012. To be fair, it must be noted that Horn and Putnam acknowledge the possibility that the Roman Catholic Church, being aware of the prophecies, may actually implement certain strategies in order to cause the fulfillment of Malachy’s prophecies. However, they also dismiss that this is sufficient to account for what they believe are many things over which individuals and the Church as a whole could not exercise influence. So, is Pope Francis history’s final pope? The Lord certainly knows. But that he is the final pope cannot be known based on the research, evidence and logic used by Horn and Putnam in drawing their conclusions on this point. Although they have done a tremendous amount of helpful research, the emphasis they place on the accuracy of extra-biblical prophecies and conjecture, including those from pagan sources, and the conclusions they draw from these present serious problems. As it relates to the prophecies, much of the foundation upon which the authors have built is made up of the work of pagans, mystics, frauds, forgers, heretics and false prophets. This issue is even reflected in the subtitle of Petrus Romanus—The Final Pope Is Here. On the one hand, even though in a comment criticizing this article Putnam says that he only assigns a 60-70% probability that they are right, the subtitle of the book implies that they are quite confident they have it right when they conclude that the pope following Benedict XVI would be the final one. One concern with this is that despite these problems, the authors are apparently having a tremendous influence on at least certain segments of the Body of Christ. 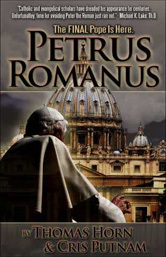 As of today, March 22, 2013, the paperback version of Petrus Romanus is ranked at #945 out of millions of books on Amazon.com, with it sitting at #4 in the “Religious Warfare” category, #4 in the “Catholicism” category and #74 in the “Christian Living category. However, even more telling and more sadly, the Kindle version of Petrus Romanus is ranked at #1 in both the “Eschatology” and “Prophecy” categories, and #10 in the “Christian Reference Works” category. This represents a lot of books being sold and a lot of people being influenced—undoubtedly believers and unbelievers alike. In June of last year, Tom Horn was keynote speaker at the 2012 Prophecy in the News Conference in Branson Missouri. Speakers at that conference included Jonathan Cahn, Joseph Farah, Chuck Missler, Bill Salus, and Gary Stearman among others. In July of this year, Horn will be addressing the Pike’s Peak Prophecy Summit, which is already sold out of tickets. The list of other speakers includes Cris Putnam, Jonathan Cahn, Joseph Farah, Gary Stearman, Chuck Missler, L.A. Marzulli, Mark Biltz, Lennart Moller, Bill Koenig, Ken Johnson, Paul McGuire, Jerry Robinson, Stan Monteith, Doug Woodward, Bob Cornuke, Barrie Schwortz, Doug Hamp, Bill Salus, David Olander, Samuel Hoyt, Doc Marquis, Derek Gilbert and David Brennan. I do not know about the work of some of these men, but the list does include those who are respected and have quite a bit of influence among believers. When good men join together with those whose work is problematic, especially in a conference-type forum, it can create a lot of unnecessary confusion within the Body of Christ. Although we cannot know with any certainty whether or not Pope Francis will be the last pope, we can know with certainty that we continue to witness the ongoing erosion of biblical discernment as evidenced by the sales of books like Petrus Romanus and attendance at conferences where these kinds of things are taught. Beyond this, those who are exposing these issues are coming under fire more than at any time in recent memory. 6.Petrus Romanus (Kindle Locations 327-337). 8.Petrus Romanus (Kindle Locations 444-452). 9.Petrus Romanus (Kindle Locations 452-459). 10. Petrus Romanus (Kindle Locations 465-467). 11. Petrus Romanus (Kindle Locations 950-952). 12. Petrus Romanus (Kindle Locations 737-747). 13. Petrus Romanus (Kindle Locations 9287-9301). 14. Petrus Romanus (Kindle Locations 9305-9307). 15. Petrus Romanus (Kindle Locations 9308-9311). 16. Petrus Romanus (Kindle Locations 9262-9265). 17. This part of Cahn’s message was subsequently removed from YouTube.com by someone at Beth Israel because of the controversy it generated. 18. Petrus Romanus (Kindle Locations 9313-9320). 20. Petrus Romanus (Kindle Locations 9238-9240). 22. Petrus Romanus (Kindle Locations 8666-8670). 23. Horn, Petrus Romanus (Kindle Locations 9246-9253). 24. Petrus Romanus (Kindle Locations 9240-9246). 25. Petrus Romanus (Kindle Locations 9046-9050). 26. Petrus Romanus (Kindle Locations 792-797). 27. Petrus Romanus (Kindle Locations 798-799). 28. Petrus Romanus (Kindle Locations 801-804). 29. Petrus Romanus (Kindle Locations 1592-1593). 30. Petrus Romanus (Kindle Locations 1693). 31. Petrus Romanus (Kindle Locations 1231-1233). *Exhibit B is apparently an image of St. Malachy. It was published on Tom Horn's Raiders News Update website, "Today's Top Raids," 2/11/13, with the promotional text: "As Predicted By St. Malachy Before Tom Horn & Cris Putnam -- The Last Pope Is Here! As the legend goes, Malachy experienced what is today considered a famous vision commonly called “The Prophecy of the Popes.” The prophecy is a list of Latin verses predicting each of the Roman Catholic popes from Pope Celestine II to the final pope, “Peter the Roman,” whose reign would end in the destruction of Rome. According to this ancient prophecy, the very next pope (following Benedict XVI) will be the final pontiff, Petrus Romanus or Peter the Roman...."
*Exhibit C was published on Tom Horn's Raiders News Update website, 2/13/13, "Today's Top Raids," with the promotional text: "So What Did Tom Horn & Cris Putnam Write In 2012 About The Prophecy Of The Popes? Here Is Part One. Sixteen months after the journey began Malachy finally arrived in Rome, his heart and mind lifted and hopeful. Quickly, he was brought to Pope Innocent II for official audience. Innocent approved Malachy’s request for the pallia but with strict conditions: Malachy would take on new responsibilities. He was now the Papal Legate of Ireland with all of its ensuing political intricacies. This was not what he had wanted; he so desperately desired the peace and serenity of the Abbey. It was upon leaving the seven-hilled city so frustrated, framed by the breathtaking Western view from Janiculum Hill that it came upon him. Because of the impiety of the popes, Rome would burn. As the legend goes, Malachy experienced what is today considered a famous vision commonly called “The Prophecy of the Popes.” The prophecy is a list of Latin verses predicting each of the Roman Catholic popes from Pope Celestine II to the final pope, “Peter the Roman,” whose reign would end in the destruction of Rome. According to this ancient prophecy, the very next pope (following Benedict XVI) will be the final pontiff, Petrus Romanus or Peter the Roman." *Exhibit E was published on Tom Horn's Raiders News Update website several times. The first time we noted it, 8/18/12, it was with the promotional text: "Does Ancient Catholic Prophecy Suggest The End Is Near? In this installment of Prophecy Update Radio, host Bill Salus takes a look at the end time’s role of Roman Catholicism in Bible prophecy. 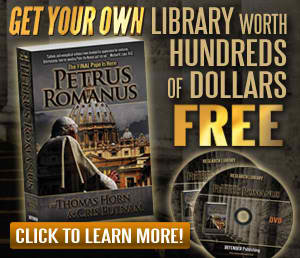 Bill interviews Cris Putnam, the co-author with Tom Horn of the bestselling book called Petrus Romanus. This timely and fascinating interview takes a close look at the world religion of the last days, and its potential ties to Catholicism. John spoke about a literal city that reigns over the kings of the earth. He says it was a city sitting upon seven hills, which at the time was known by both pagan and Christian sources as the city of Rome. These clues in addition to the other details John included, strongly suggest that he was describing a future apostate religious system that would be headquartered in Rome. Moreover, an ancient Catholic prophecy predicts there will be a final Pope. Some believe the next Pope might be him. His name could be Peter the Roman (Petrus Romanus). Could we be living in the final generation during the time of the final Pope? What are the prophetic implications of an ancient extra – biblical prophecy written by Saint Malachy?" On 12/26/12 the graphic appeared with the following promotional text: "RFID Tracking Chips At The Vatican: Is This Prophetic Move In Rome Fulfilling The Prophecy Of The Popes? The announcement that thousands of Vatican clergy and employees will be issued an identification card with an RFID tracking device comes as no surprise following the Vatileaks scandal. Even the Pope needs to be concerned about confidentiality and security. However, His Holiness seems to be following the Prophecy of the Popes and bringing us one step closer to Armageddon. Sound far fetched? The fact that the last 111 popes were all named in a 900-year-old prophecy is thought provoking enough. But the idea that Pope Benedict XVI may be the Last Pope before the Apocalypse, he’s issuing tracking devices to the masses, and he’s one of the most politically influential men in the world should make you sit up and take notice. Because according to the Prophecy of the Popes, the next pope will be the last, and he’ll usher in the Antichrist. Nine hundred years ago, Pope Innocent II summoned Saint Malachy to Rome for an annual accounting of his Northern Ireland Parish. On his return trip, Malachy had a vision in which God revealed to him the identities of the next 112 popes. While the names Malachy saw in his vision were cryptic, theologians have found them to be extremely accurate. For example, in the vision, Pope number..."
NOTE: The Discernment Research Group has written extensively about the rise of apocalyptic paganism in the prophecy movement of the evangelical church. Other HERESCOPE articles on this topic include: "COSMS, CODES, AND CRYPTOLOGIES:"